So after Kintamani, I managed to get to Pandangbai after another costly private ride for which I bargained a lot and still got a lameass prize. I will get good at this someday... In Ubud, Natacha told me about the Guili Islands which were a great place to enjoy snorkelling, nature, the beach and a relaxed atmosphere. 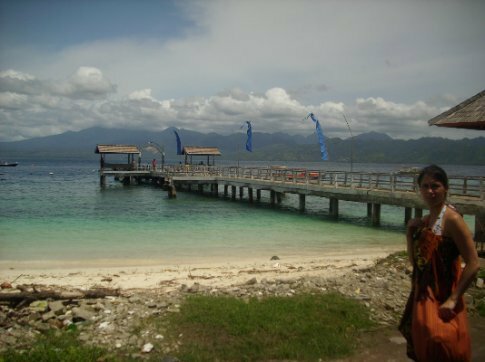 I decided to go to the biggest of the three : Guili Trawangan for a few days before heading to Yogijakarta. The night before my arrival there, I bumped into the group of friendly canadians from the Kintamani trek : Ben, Annick and Annie. The three of them are from Montreal suburbs. It has been great for me to hang out with them as we were going the same way and they were really friendly people. I got to learn many of their expressions, that are often really funny from the metaphors they use. I also had a chance to listen to their accents which I am trying to learn to use in Improv. I am not there yet, but it certainly helped. On the ferry we also met another couple of canadians that were just as friendly: Stephane et Bianca. The ferry took a long time to get to Lombok so we got to speak a lot and I asked many questions about french canadian humorists, singers and their culture in general. Was really cool ! Then we arrived in Lombok and took the bus to Sengigi on which I met another friendly french speaker : Nico. He was from the dutch speaking part of belgium but spoke very good english and french. He is fond of diving and currently travelling for two years. He had seen a lot and visited many countries on all continents even some dangerous parts of Africa. We had a cool night in Sengigi listening to live bands and then left for te Guilis. we arrived around noon. Bianca and Stephane had already been there and knew about a small guesthouse that had clean decent room inland for 4 euros per night including breakfast. Nice ! Guili Trawagan is a great place to relax and have fun : no car of motorbikes, the only mean of trasnportation is horse and carriage which I never took. I am allergic to horses. There are also many cats with cut off tails on the island, yet there are no dogs. It is a bit strange, some local told us that one of the local delicacies was cat tail soup. I think he was joking. Even if it is the biggest, you can go around the Trawangan island by foot in about 2 hours walking if you take your time. You can stop on the way to chill out and have drink or snorkel. It was still the raining season and it was getting very intense at times. Sometimes I' be walking on the islands streets and footpaths with water up to the knees. Thankfully there is a litte cinema where you can go and watch the latest movies in exchange of a food and drink order of more than 2 euros per person– really nice ! There also are little huts where you can lay down on cushions and have you own private film viewing room on the beach. We did not do much there apart from walking around the island, snorkelling, enjoying the beach and partying at times. We took a diving trip where we got to see a huge amount of fishes and corals. There was even more to see than in Ko Phi Phi. It was really awesome ! I had bit of motion sickness in the water, to start with and then things went smoothly. I got to swim with a big turtle near Guili Meno (the secon biggest island of the three), it was magic. I also got stung by tiny redish and transparent jelly fishes, it was not so magic. Then we went near Guili Air (the smallest island of the three) to see some giant clams and have lunch on the beach. Was great ! I headed back to my room with a big sunburn on my back and arms, eventhough I did put suncreme on and it was meant to be waterproof...Anyways as usual, you'll find the pictures of my stay on island in the « Guili Travangan » album. I changed my plans since, I dont have many days left, I will not go to yogijakarta but to Kuala Lumpur instead, which is much closer to Singapour, my port of departure from Asia and back to Europe.I gotta rush know since I want post all this, upload the picture and find a ride to the airport as my plane to Malaysia is at leaving at 2pm. Thanks again for reading my blog, comments are as usual very appreciated and welcomed. Excuses moi de pas trop donner de signe, mais je suis hyper pris en ce moment avec mon nouveau boulot sur Lyon ! En tout cas j'ai bien reçu ta premiere carte pour Janvier, MAIS j'attends celle de Février !!!! J'espere que tout roule pour toi, et que ce voyage est riche en decouvertes comme en émotions. Content de voir que tu aies pu finir ton séjour indonésien sur une note positive !! what a place and story...guess i have to go there next time and do all the country including borneo. i was very very busy,thats why i didnt mail but read you story and saw the pictures...in one word...awesome!!!!!!!!!! even better snorkeling than in phi phi....now i am curious! back to the real concrete world then. we will mail as you get back...then i can send you the pictures....got them ready for you.